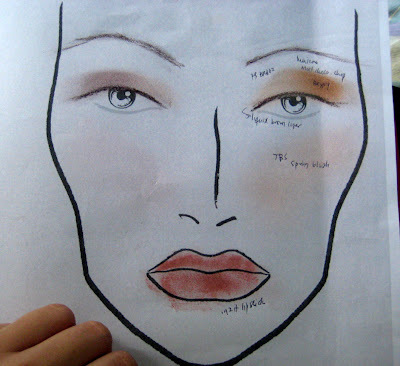 IAMBRIGITTE : an attempt on natural look..
an attempt on natural look..
a week ago, my friend asked me to do her makeup for a wedding she'd be attending. i said yes right away but the truth is i am so nervous. i am not yet comfortable on putting on makeup on other people but since i decided to take up classes, i might as well take every chance i get to practice. anyways, here's what i was able to come up with. i forgot to take a picture of her before i applied makeup on her. she came late and haven't had lunch yet. so i let her eat first while i prepared my stuffs. the left part would be a combo of pink and violet (which she doesn't like) and the other half are, well...neutral colors with a bit of shimmer. the eyeliner on the right eye is thicker because she has a slight bump or curve on her right eyelid...i should've applied it thinner than the left and maybe that could have helped to at least give it the same thickness (ack, another boo-boo). i know i didn't do it well but she's happy about it and well, me too. i am still learning and i hope i could do better next time. 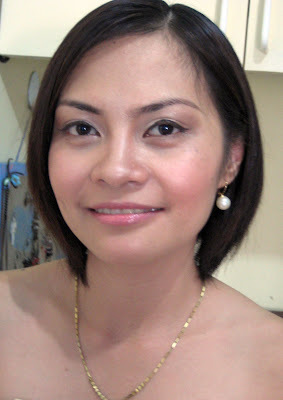 thanks again Merie Cris for trusting me with your makeup. Classy and natural! good result. hey it does look natural! You pulled it off! what are you worrying about?? GALING! Her brows are great! You did really well on this neutral look. What about a thinner line for her eyeliner ? jie jie yup, i must've lined a thinner line sa right eye nya..pinantay ko kasi sa kabila i forgot meron nga palang slight curve sa right eye.